Despite the fact it’s highly illegal and carries a strict jail sentence in most countries, hundreds of thousands of dollars worth of fake money is still circulated around the world each year. When it comes to counterfeit money it’s often unsuspecting travellers who fall victim to scammers or dodgy shop owners trying to rip them off. 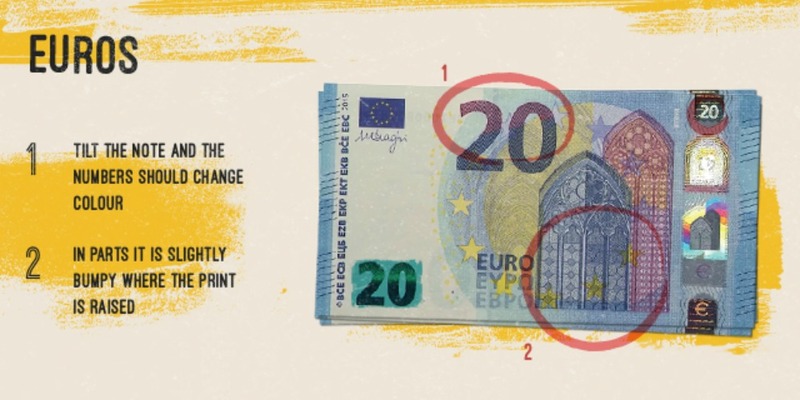 The best way to avoid ending up with a fake note in your pocket is to know what you’re looking for — these tips from the International Currency Exchange (ICE) will be a great help. The International Currency Exchange recommends folding one side of the bill before unfolding it to an angle of roughly 130 degrees. Hover a magnet over the ‘1’ and watch closely. If the bill moves, it’s real. 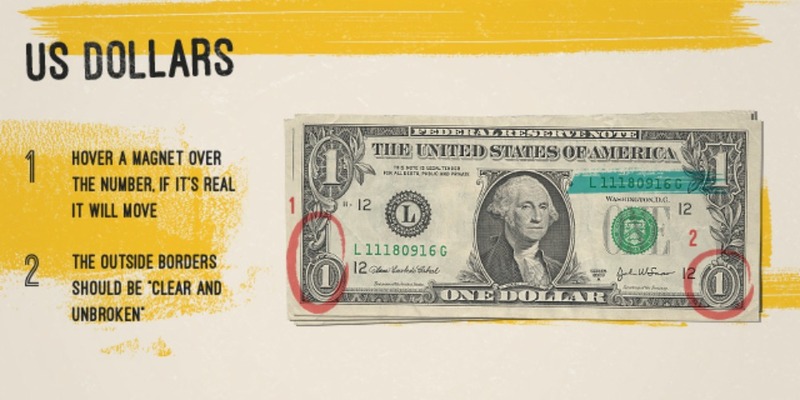 It also suggest checking the serial number — if the number is a different number to the Treasury Seal, or matches that of another note, it’s a fake. Also, if your bill is blurred or fractured on the borders, it could be a fake. The Australian dollar notes are all about the feel as much as the look. When held to the light, you should be able to spot the Australian Coat of Arms towards the right-hand side of the note. The dark areas on the note use a special raised ink and can be felt with your finger. If this area is flat, it could be a fake. If your Euro is real you should be able to see the numbers on the €50, €100, €200 or €500 notes change colour from purple to olive green or brown when you tilt them. 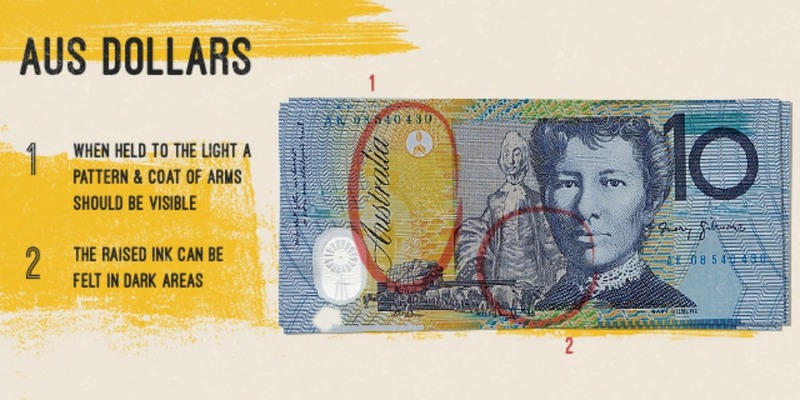 Similar to the Australian note, you should be able to feel small bumps across the note when you run your fingers across it. If it’s flat, you’ve got a fake on your hands. 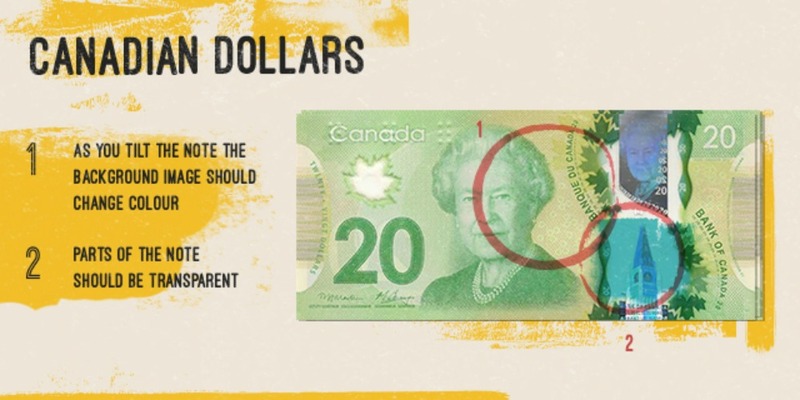 The Queen is at your service on the Canadian note! The metallic portrait of her and the building next to her should be transparent. The building on the note should also change colour when tilted. Finally, the maple leaf on the left-hand side of the Queen should be transparent — if not, it could be a fake! A metallic thread is embedded on every British pound. This shows up as a dashed silver strip that runs from the top to the bottom just off centre of the note. If you hold the note under a UV light, the numbers should also appear bright and vibrant. It is also recommended that generic features such as the feel of the paper and raised print be checked. 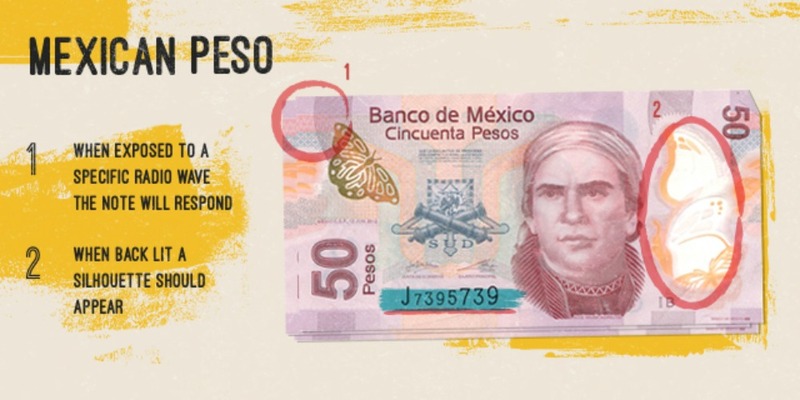 All banknotes in Mexico have a ‘watermark’ added to them. When you view the note through a back-light, the silhouette image should appear in an otherwise clear area of the note. The yen makes use of Japan’s most famed flower — the cherry blossom. If the note is real the hologram of the cherry blossom with change colour and design with the note is titled. 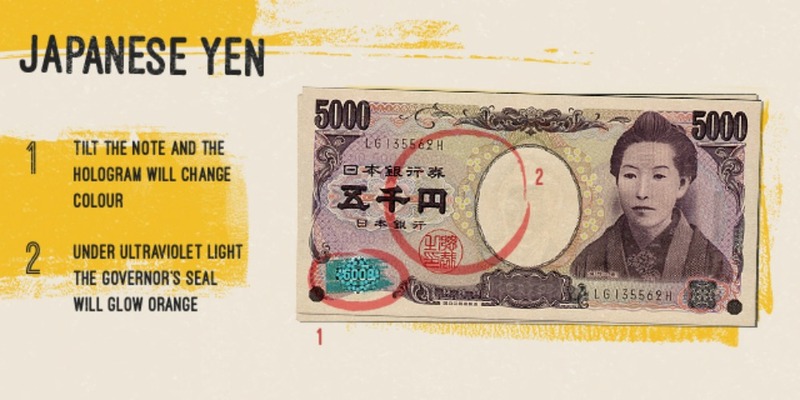 When the banknote is viewed from a certain angle, the value of the note will appear on the bottom left of the front side, while the word ‘Nippon’ (‘Japan’ in Japanese) will show on the top right of the back side in capital letters. Finally, when held under an ultraviolet light, the Governor’s seal on the front side should glow orange. Have you ever been dealt a counterfeit note? Are you careful with your money when you travel?